Home › Investing › What Is UVXY? What Is UVXY? The ProShares Ultra VIX Short-Term Futures ETF [UVXY] is among the most infamous of all exchange-traded funds. You can buy the ETF the same way you would purchase a stock at a broker like thinkorswim or tastyworks. But don’t expect a buy-and-hold strategy will lead to portfolio returns that rival those of the Oracle from Omaha. Any daring investors who have bought and held UVXY for any lengthy timeline know its perils. In fact, we couldn’t find a single year since inception when the UVXY price was higher at the end of the year than when it began the year! Below we’ll cover the dangers of trading UVXY as well as the ways to make money from it, so let’s dive in! Why Does UVXY Share Price Fall? What Is UVXY Stock Price History? Can UVXY Fall To Zero? What Is The UVXY Expense Ratio? The ProShares Ultra VIX Short-Term Futures ETF tracks the performance of the S&P 500 VIX Short-Term Futures index for a single day. But it doesn’t track it on a 1:1 basis. Instead UVXY is 1.5x leveraged meaning that its results (before fees and expenses) correspond to one and one-half times the performance of the S&P 500 VIX short-term futures index. It is designed for investors who want to gain exposure to stock market volatility via the futures market. So how does UVXY work? In a nutshell, it measures the return from a rolling long position in the first and second month VIX futures contracts. Generally, this will mean that UVXY will fall over time but every once in a while expect it to skyrocket higher as volatility spikes. Because of its tendency to decline in price over the long-term it frequently undergoes a reverse split, meaning that the share count is reduced and the price is increased. UVXY reverse splits can be 1:2, 1:3, 1:4, or even 1:5, meaning that the price spikes 5X while the share count is reduced proportionately to keep the overall “market cap” the same. Some traders assume that UVXY tracks the CBOE Volatility Index [VIX] but in fact that is not true. Instead, UVXY tracks VIX futures, which are a different animal altogether. If you were to bet on a spike in volatility, the VIX may rise big time. But the futures may build in a forecast that share prices will return back to median levels. So, when you bet on higher VIX prices, you may not see the same returns by gaining exposure to the futures market! With that said, historical results show that the UVXY correlates fairly closely (>90%) with the movements of the Volatility Index, or VIX. Trading the UVXY is not for the faint of heart. Before diving in you should know the risks. And most importantly, you should know why the UVXY price history shows a regular downtrend with infrequent spikes higher. A process known as contango loss negatively affects the UVXY share price. Contango loss is the process of VIX futures declining in value as they approach the value of the VIX. The declines in price on most days weigh down the underlying UVXY index and is amplified by the 1.5X leverage. While some stocks and exchange-traded funds are meant to be held for the long-term, UVXY is not among them. Companies like Facebook, Alphabet, or Amazon are plays on the long-term. When Facebook sells more advertising, it makes more. When more people click, Google enjoys rising revenues. And when Amazon ships more goods and sells more services, it sees its top line grow. By contrast, the UVXY stock price history is in perpetual decline. 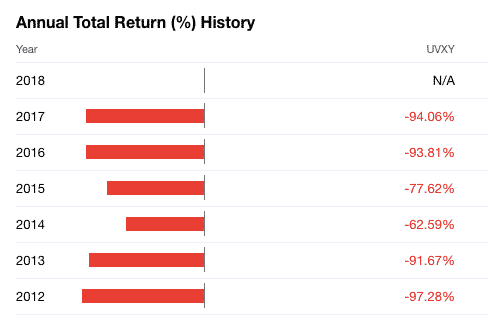 In fact, since UVXY was created, you can see the ROI year-over-year performance is highly negative. When you look up online a UVXY quote or UVXY after hours price, the number will generally match the S&P 500 Short-Term Futures Index. However, so-called whales will cause the price to spike from time to time when making large purchases or indeed cause it to dip when shorting a large number of shares. To ensure the UVXY stock quote closely matches the underlying index it tracks, market makers step in when needed to take the other side of the trades. Much of the order matching and market-making is done by computers however, so few human market makers are needed to ensure price stability. Yes. In fact, UVXY has historically been known to effectively “blow up” and wipe out buyers. Contango losses can cause the UVXY price to change dramatically in the blink of an eye. Buy-and-hold investors should look elsewhere. Usually, when the UVXY price is close to zero, a reverse split takes place to boost the share price back up to a higher level and the process starts all over again? According to ProShares, the expense ratio for UVXY is 0.95%. With over $500 million in assets under management, this means that the managers would make over $4.75 million per year if every penny was invested. But UVXY usually holds a large cash position and collects interest when invested in Treasury bills and other fixed-income investments. It is tempting to jump in feet first and buy the ProShares Ultra VIX Short-Term Futures ETF because the price can soar, and even double, in lightning speed. For risk-takers and gamblers, the appeal may be too great to resist. But for conservative investors looking for predictable income, it’s worth looking at more conventional dividend-paying stocks and perhaps selling covered calls on them for extra yield. The flipside is if UVXY has such a predictable history of declining, why not short it? Shorting can be highly lucrative. And if you had to choose between buying UVXY vs shorting UVXY, shorting is probably the wiser choice. But shorting UVXY is by no means a golden ticket. The danger of shorting it is that it can skyrocket higher in the blink of an eye, causing untold losses. In fact, the volatility is so high that whether you are tempted to buy or short, you will probably need to fasten your seat belt and prepare for a wild ride! If the volatility spikes don’t scare you off, you can trade UVXY at almost every top online broker. Because UVXY is an exchange-traded fund that is based on the price of futures, a broker who understands derivatives, like options and futures, is going to be your best bet. Both the industry leader when it comes to tools and screeners, thinkorswim, as well as tastyworks, which is nipping at its heels are experts in options trading and futures trading. No matter which you choose, you will find top notch customer support staff able to help you buy or short UVXY. 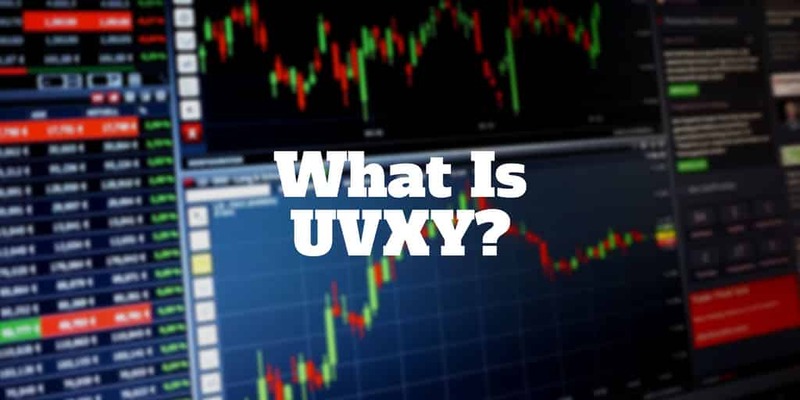 Does the UVXY chart scare you or entice you to trade the exchange-traded fund? Let us know if you have bought or shorted UVXY? How did it go? We would love to hear from you. >> What Are The Best Online Brokers? >> Fix Your 401(k) Easily With Blooom! ‹ How Often Is Credit Score Updated?